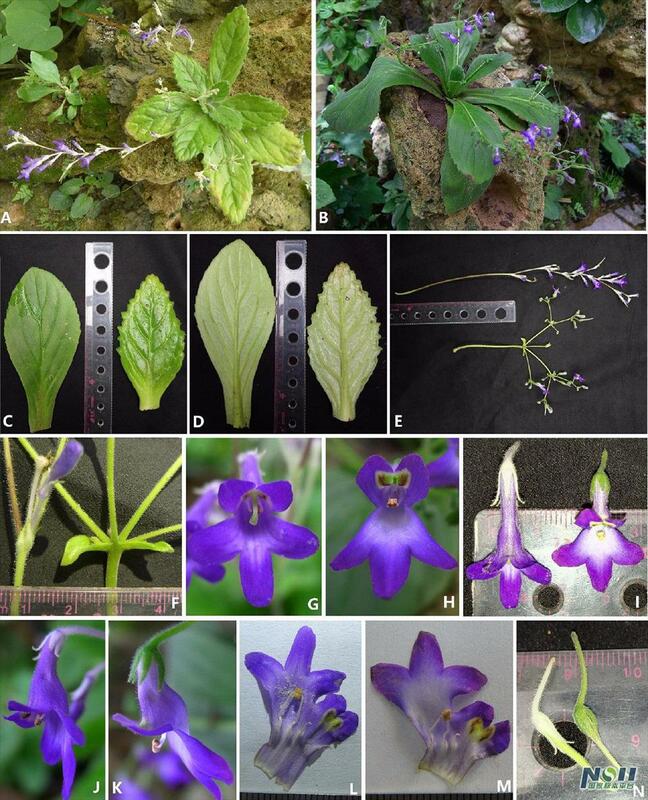 ABSTRACT：A new Primulinaspecies from Guangdong, China with anunusual inflorescence is described here. Primulina anisocymosa is vegetatively most similar to P. bobaiensis. It can be distinguished fromall species within Primulina morphologically by its unique zigzagmonochasial cyme and infructescence. To confirm the phylogenetic relationshipsand generic placement of this species, not only morphological anatomicalfeatures but also chromosome and DNA sequence data were examined and analysedhere. Two samples from different populations identified as Primulinaanisocymosa are monophyletic and were nested in a monophyletic clade withinPrimulina with high branch support. The somatic chromosome number of thenew species is also reported (2n D 36), supporting its placement in thegenus. 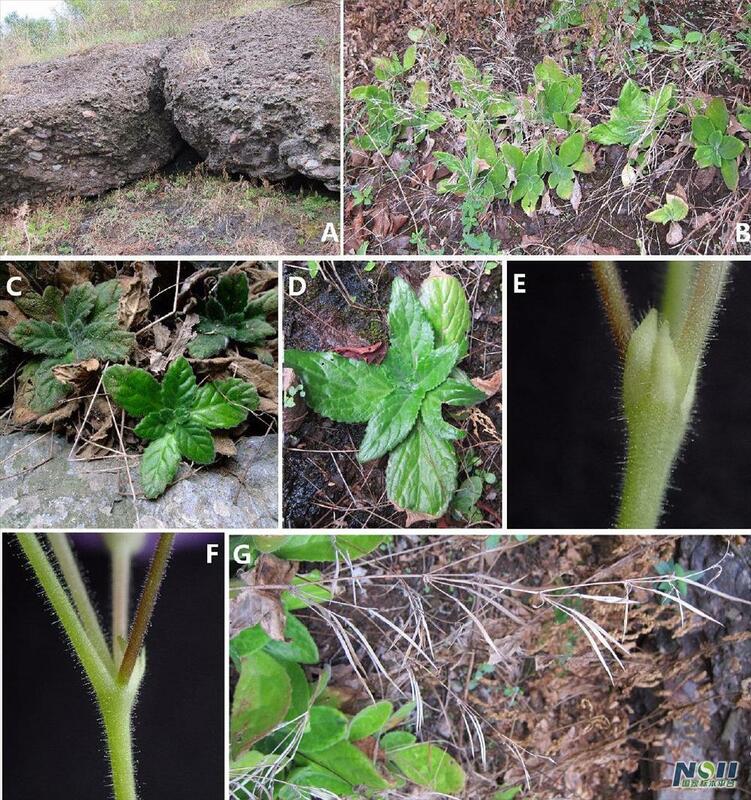 Primulina anisocymosa (F Wen, Xin Hong and ZJ Qiu) (A, B) 生境 (A, 广州; B, 阳春) (C, D) 植株 (C, 阳春; D, 广州) (E) 小苞片,示不对称,在花梗基部一边对齐. (F) 聚伞花序,退化为点附着,在基部形成肿胀的结节. (G) 锯齿状果序. 温放摄影. (A) 花期异序报春苣苔的植株. (B) A. 花期博白报春苣苔的植株. (C) 叶表面 (左:博白报春苣苔, 右: 异序报春苣苔). (D) 也背面(左:博白报春苣苔, 右: 异序报春苣苔). (E) 花序 (上:异序报春苣苔, 下: 博白报春苣苔). (F) 苞片(左: 异序报春苣苔,右: 博白报春苣苔). (G) 异序报春苣苔花冠正面观. (H) 博白报春苣苔花冠正面观. (I) 花冠俯视图 (左:异序报春苣苔, 右: 博白报春苣苔). (J) 异序报春苣苔花冠侧面观. (K) 博白报春苣苔花冠侧面观. (L) 异序报春苣苔花冠剖开. (M) 博白报春苣苔花冠剖开. (N) 无花冠雌蕊(左: 异序报春苣苔,右: 博白报春苣苔).洪欣和温放摄影.